Whenever I sit through a PowerPoint presentation, I am inevitably left with two conclusions. One, very few people possess the skills to stand up in front of others and make a good, entertaining presentation. And two, most people are utterly clueless when it comes to designing an effective PowerPoint slide show. In fact, even those who possess some presentation skills almost always cancel those skills out with a horrid PowerPoint slide show. A simple fact to keep in mind when creating a PowerPoint slide show is this: no matter how interesting you think your topic is, other people will not share your enthusiasm. In other words: regardless of your presentation skills, no one in the audience is going to be blown away by your content. Let’s hammer that point home one last time: if you start from the premise that no one gives a damn what you have to say, and realize that every last member of your audience is going to zone out during your presentation, you just might be able to leave your audience members with a positive impression. With this idea in mind, I am going to provide you with some tips on how to create a good PowerPoint slide show. 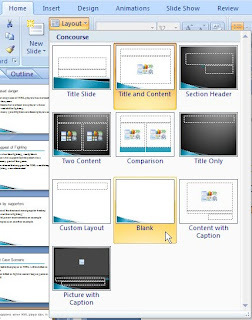 Specifically, the following is both a tutorial on creating a PowerPoint slide show—step-by-step instructions that show you which buttons to click— and advice on how to effectively format the content. 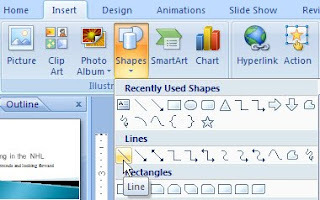 —A computer with Windows operating system and Microsoft PowerPoint 2007. —A basic understanding of PowerPoint. 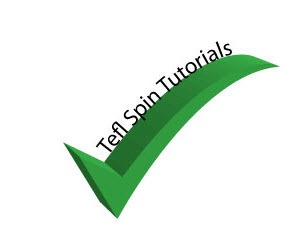 This tutorial is not aimed at absolute beginners but the instructions give as much detail as possible. Users who have created numerous slide shows will find most of the instructions unnecessary, but they still may find useful suggestions throughout. And the instructions could be helpful for those who have created PowerPoint slide shows before but still feel there are some gaps in their knowledge. Before starting this tutorial, I urge you to first prepare the content that you want to add to the slide show. On the other hand, you may be the type of person who likes to have the structure of the slide show sorted out before you start to write your material. Having the look and feel of the slide show established can serve as a motivation for some people to create the content. When you are finished this section of the tutorial, you will have the basic skeleton of your slide show in place. You will have a consistent design for your slide show, including font style and size, and bullet point arrangement. 2. Click the Design tab. 3. In the Design ribbon, select the Concourse theme. Note: for the purposes of this tutorial, I am using the Concourse theme. For ease of following this tutorial, I recommend you use this theme as well. Note: This tutorial does not include instructions on how to tweak pre-existing themes, though PowerPoint 2007 provides numerous options for doing this. 4. Click the Microsoft Office Button. 5. 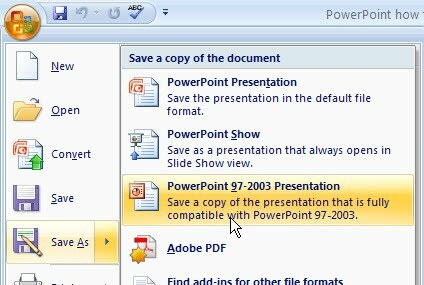 Click Save As and then click PowerPoint 97-2003 Presentation. Note: if you are certain that the computer you will use for the presentation has PowerPoint 2007, then you can save the presentation as PowerPoint Presentation. 1. Click the View tab, and in the View ribbon, in the Presentation Views group, click Slide Master. 2. In the thumbnail pane, click the topmost slide so that it is highlighted. 4. 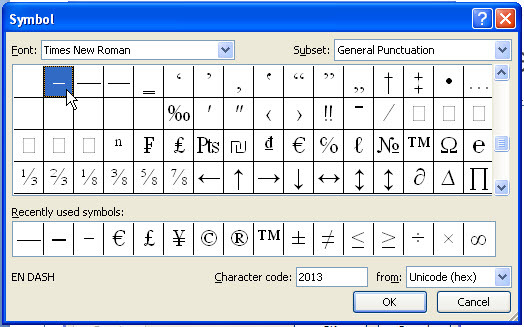 Click the Home tab, and in the Font group, select Arial font, size 40, and unclick the Bold button. 5. Highlight the text in the first bulleted point, and change the font size to Times New Roman, size 30. 6. In the Paragraph group, click on the bullet point drop down arrow and select the square shadowed bullet. 7. 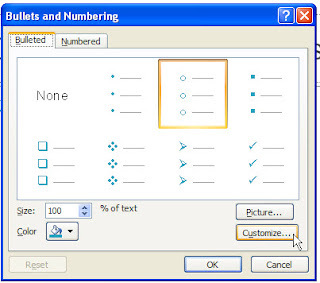 Change the second level text to Times New Roman, size 28, and bullet type en-dash (click the bullet drop down menu, click Bullets and Numbering, click Customize, click en-dash, click OK, click OK again). Most people with experience presenting in front of others are familiar with the "Tell 'em rule." —Tell 'em what you're going to tell 'em. —Tell 'em what you told 'em. A simple organization method that increases the likelihood that your audience will retain at least some of what you talked about. Adding a title page, table of contents and an objective slide is a great way to start your slide show and adhere to this method of organization. 1. Click the Slide Master tab. Note: the Slide Master tab only appears in the tab bar after you open Slide Master. 2. At the far right hand side of the ribbon, click Close Master View. 3. 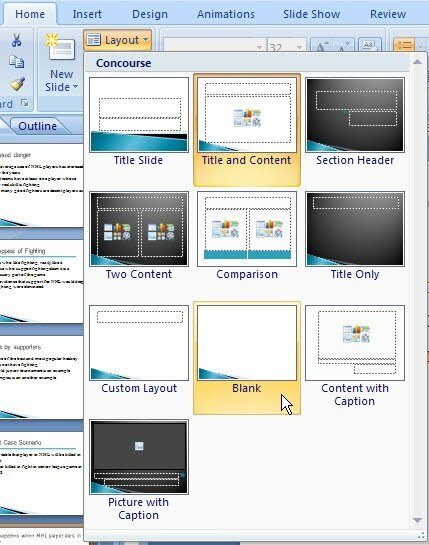 In the slide pane, click in the title slide and add the title of your slide show. Note: the work we did in SlideMaster in the previous set of instructions was for the slides that appear in the body of the slide show. As the title page is only one slide, I don’t see much point in creating a master slide for it. Format the font style and size directly in the title page slide. 4. In the thumbnail pane, click the second slide from the top, and then in the slide pane, click in the title area and type “Table of Contents." Note: you should see that the formatting that you added in SlideMaster appears in the current slide. 5. 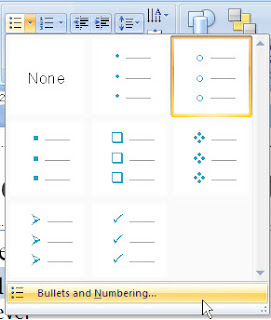 Add your section titles as bullet points. Note: any more than five or six sections in your presentation and things are getting too complicated. Cut or merge some sections. 6. Click on the second slide in the thumbnail pane, and then press the Enter key on your keyboard. Result: a new slide appears (the third slide). 7. In the slide pane, type “Presentation Objective” as the title of the third slide. 8. Add one to three objectives that you hope to accomplish with your slide show. Note: I find that adding an objective slide is a good way of further previewing your slide show and piquing the interest of your audience. 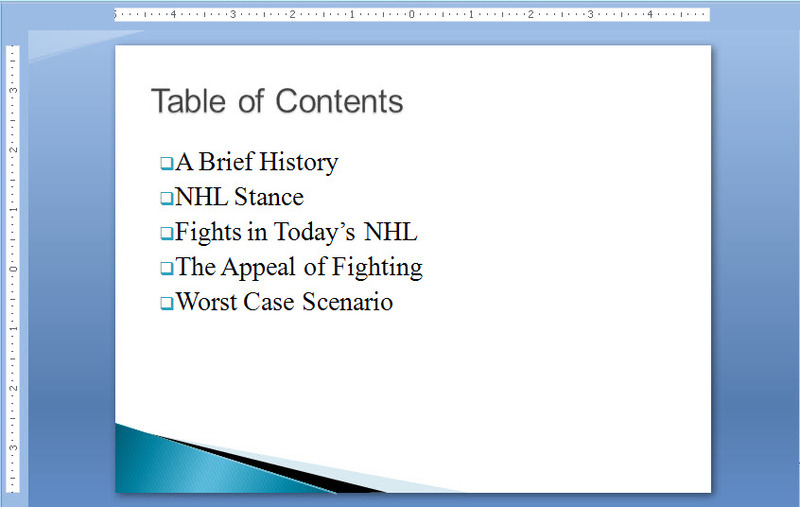 I always try to indicate the flavor and tone of the slide show with the objectives. If you are trying to persuade your audience of something, you can hint at it in the objectives or state it outright. Now that you know what your topic sections are, you can create a slide that introduces each one. We are going to add a line under the title of section slides so that they are different from the rest of the body slides. This tells your audience, “New Section: perk up, take note, some new information,” regardless of what you are also telling them with your voice. 1. 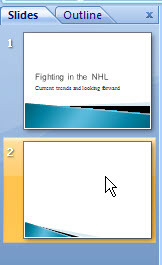 Click the third slide in the thumbnail pane(or whichever was the last slide before the body of the presentation is to begin). 2. Press Enter on your keyboard to add a new slide. 3. In the title area of the slide, add the first title section. Note: check the Table of Contents slide to ensure you are replicating the exact wording of the section title. Consistency in wording always results in a more effective slide show. 4. Click the Insert tab. 6. Under the Lines section, click Line. 7. Position the crosshair cursor under your section title on the slide, simultaneously left click your mouse, hold down the Shift key on your keyboard, and drag the cursor to the right. Note: you hold down the Shift key to ensure that the line remains straight. Tip: if you wish to thicken the line, hover your cursor over the line so that the crosshair-with-points appears, and click. Next, click on the Home tab, and then in the Drawing group, click on the Shape Outline button, click Weight, and select the thickness of line that you want. Tip: if you don’t like the positioning of the line, hover your cursor over the line and click. Then, use the right, left, and up, down arrow keys on your keyboard to re-position the line. 1. In the slide you created in the previous set of instructions, hover your cursor over the line you added, and click so that the line is selected. 2. On your keyboard, press and hold down the Ctrl key and then press the letter C button. Note: this is a shortcut that copies the line. 3. In the thumbnails pane, click on the slide on which you are currently working, and press Enter on your keyboard. 4. In the new slide that appears in the slide pane, type in the second section title. 5. Press and hold down the Ctrl key on your keyboard and then press the letter V key. Note: this is a shortcut for Paste. Result: the line that you created in the previous slide should now appear under your second section title. 6. Create new slide for each new section slide and copy the line into those slides in the same way as indicated in the above steps. Result: you have a new section slide for all the sections that appear in your Table of Contents. 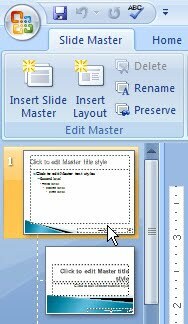 Note: just as you created Master slide for the body slides of your slide show, you could also create a Master slide for the new section slides. Now that you have all your new section slides in place, you are ready to start adding content slides to each section. 1. In the thumbnail pane click on the first slide of the first section. 2. In the slide pane, click to the right of the first bullet point and add your content. Note: should you preview each section in detail? In other words, should you include a mini table of contents for each new section? Personally, I believe that this becomes redundant. If the section is quite long, you may want the content in the new section slide to preview what is to come in that section. But in general, I would just dive in to the content that you want to present. The section title should be enough of a preview in most cases. 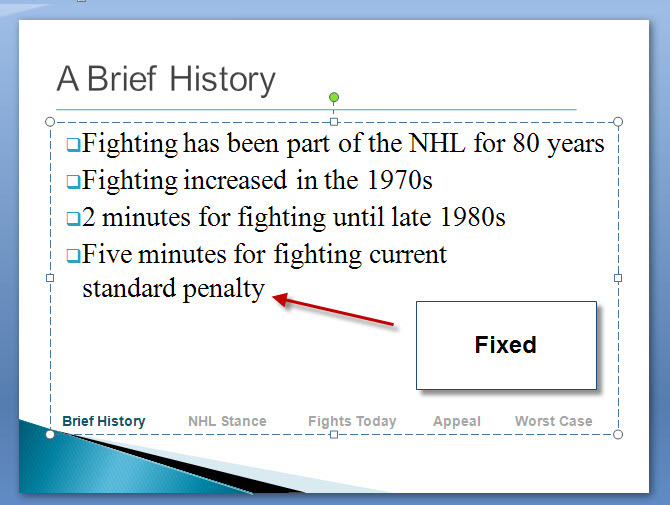 Tip: I highly recommend that you put no more than five bullet points per slide. Three or four is even better! Similarly, each bullet point should be as short and concise as possible. Finally, wherever possible, keep the bullet points parallel. In other words, if the first bullet point starts with a verb, make all of them start with a verb. Don’t take this “rule” to absurd lengths. If keeping all bullet points parallel would detract from your intended meaning, then don’t do it! 3. Add the remaining content in the subsequent bullet points. 4. Add as many new slides as you need for the section. 6. Add content to remaining sections. Note: to reiterate what I mentioned before, only the first slide in each new section should have the line under the title. After you have added all the content to your slide show, you can add a final slide that can remain on the screen while you are taking any questions at the end of your presentation. Before you add the final Q and A slide, you may be wondering about a summary slide. In keeping with the "tell 'em rule," you well may want to add a slide to summarize what you have presented in your slide show. Keep this slide very brief and re-state the main points that you made throughout the slide show. On the other hand, you may want to orally summarize with the Q and A slide on the screen. 1. Add a new slide to the slide show. Note: this should be the last slide in the presentation. 2. In the Home tab, in the Slides group, click the Layout button. 3. In the drop-down that appears, select the Blank slide. 4. Click the Insert tab, and in the Text group, click the Text Box button. mouse button, and in the middle of the slide, drag a text box the length of the slide. 6. Click inside the text box you created. 7. In the Home tab, in the Font group, select Arial, click inside the font size box, and type in 120, and then press Enter on your keyboard. 8. 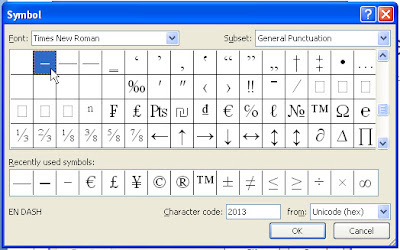 Position your cursor inside the text box and type in Q & A. Tip: to centre the text box that contains the “Q & A” text, click on the border of the text box, and then reposition the text box using the right, left, and up, down arrows on your keyboard. No matter how skilled you are as a public speaker, or how interesting your content may be, everyone in your audience, without fail, will zone out during your presentation. How often they do this, and for how long, will depend on a number of factors. But it will happen! Some of the things that I have discussed in this tutorial will help you to limit this to a degree, but you can’t eliminate it completely. Adding a running footer to your presentation will help your audience to re-orient themselves to your presentation after they return from whatever reverie they were lost in for the past however many minutes. Also, the running footer allows your audience to estimate how much time is left in your presentation. 1. Open the first new section slide. Note: there is no need to add a running footer to the “front matter” of your slide show (the title page, table of contents and objectives slide). 2. Click the Insert tab, and click the Text Box button. 3. Near the bottom of the slide, draw a text box that is not quite the length of the slide. 4. Change the font type to Arial, and the size to 16. 5. Type the name of your first section title. Note: you can abbreviate the section names. The goal is to include all the section names with spaces in between. 6. Press the Tab button on your keyboard, and then type in the second section title. 7. Add all section titles in the text box. Note: this could take some time to get all your section titles in the text box with relatively equal spacing between them. If the Tab key does not allow you to accomplish this, you can use the space bar on your keyboard as well. 1. Bold all section titles in the text box. 2. 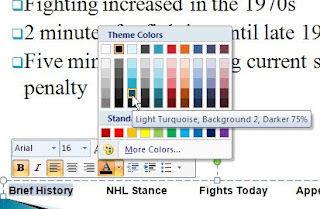 Highlight the text of your first section title in the text box. 3. 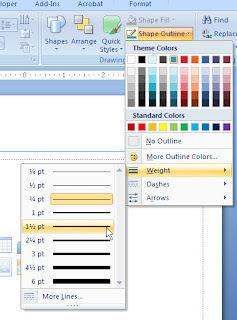 In the pop-up formatting tool bar that appears, click on the Font color button, and select light turquoise. 4. Highlight the text of the other section titles in the text box, click on the Font color button and select grey. You can now see the result: the text box highlights the current section while other sections are greyed out. 1. Click inside the text box so that the borders are highlighted with the dashed line. 2. Hover your cursor on the border of the text box so that the cursor turns into a cross hair with points. Result: the dashed line turns into a solid line, indicating that the entire text box has been selected. 4. Press and hold the Ctrl key on your keyboard, and then press the letter C key on your keyboard. 5. Navigate to the next slide in the section and press and hold the Ctrl key on your keyboard, and then press the letter V key. Result: the text box will appear on the new slide in the same location as it did on the slide from which you copied it. 6. Copy the text box into all the remaining slides in the same section. 7. Copy the text box into the first slide of the next section. 8. Change the color scheme of the section titles in the text box so that the current section title is highlighted in turquoise and the other section titles are greyed out. Warning: a potential down-side to using this type of running footer is that it is not fixed. In other words, if you test your slide show (press F5) and the footer looks fine in all slides, you could still encounter problems if you open the slide show on another computer with a different resolution and/or monitor size. To avoid this problem, simply ensure that the footer is not too wide and make sure to test the slide show on the computer you will be using when standing in front of your audience. If you are using your laptop and connecting it to an overhead projector, then checking the slide show on your laptop will tell you all is OK. I also call this footer the “zone-out bar” because of the fact that audience member who zone out will be able to re-orient themselves to the slide show when they snap out of their day dream. Images can make your slide show much more appealing. However, there is a fine line between including images and making your slide show too busy. 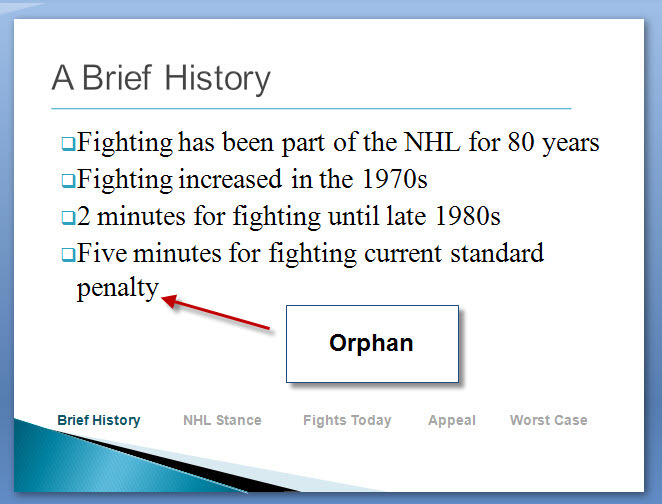 A simple rule to use is: only include an image if it is relevant to the information on a specific slide. An image for its own sake doesn’t really add much to the experience for your audience. Just as any piece of writing will benefit from a self-edit, so a PowerPoint presentation is no exception. 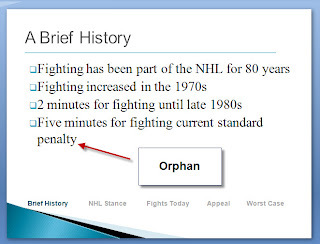 Many people forget to do a spell-check on their slide show before making their presentation. It is very easy to catch embarrassing mistakes this way. 1. Click the Review tab. 2. Click the ABC Spelling button. After you have done that, go back and check that all the topic sections in your table of contents match the topic sections of the first slide of each new section. Then, go over the slide show to ensure that the running footer you added has the correct section highlighted in turquoise for each slide. Next, go through the slide show again and check for any orphans (widows), and then eliminate them by pushing some text onto the next line. 1. Click in front of the words you want to push onto the next line. 2. Press and hold down the Shift key on your keyboard, and then press Enter on your keyboard. Finally, if you are not too worried about wasting paper, print off your slide show and do a hard copy edit. Mistakes that you might have missed during the spell-check and while scanning in PowerPoint may jump out at you when in hard copy. I hope that this tutorial has helped you to create an effective slide show! Please don't do this and use the Slide Master instead. You make a valid point about adding the running footers manually. However, by putting it in the Slide Master, the running footer would be the SAME ON EVERY SLIDE. Exactly what you wouldn't want as the running footer has to change to reflect what point you are in the presentation. Now, perhaps creating different sections so that the running footer is similar for that particular section might work. But it seems like not a lot of time saved. Unless I'm missing something here and you could fill us in on exactly how to do what I suggested in the tutorial in a way that would save time.